By now you’ve read all about how to select hard wood floors in the new year and you’re all caught up on the predicted 2018 Interior Design Trends. (In case you missed them, you can binge read the articles here and here.) 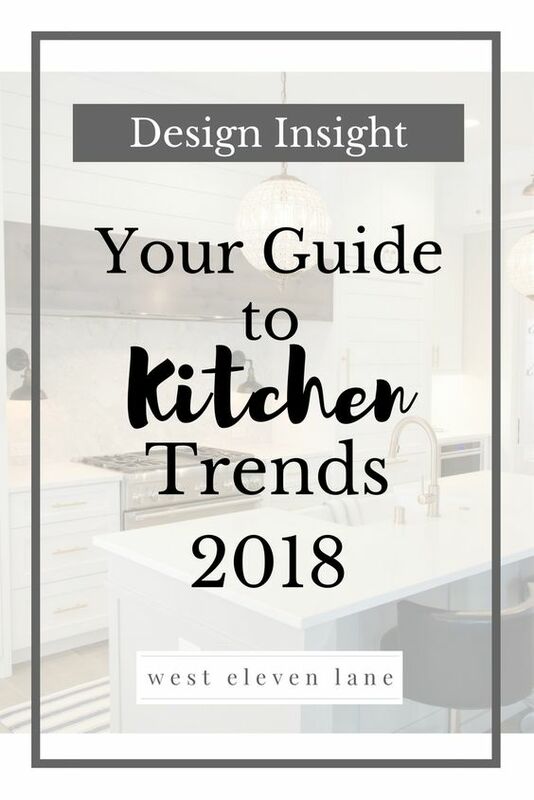 Since the kitchen is the heart of the home, I wanted to dive deeper into the design trends that are making a statement in 2018. Are you ready? Open Shelving – We’ve seen this on the scene for a few years now, and it’s definitely a trend that’s on the rise. Add personality and style to your kitchen by displaying chopping boards, stacked bowls, drinking glasses, hardcover cookbooks, canisters, etc. Keep items that are used less often like platters and cake pedestals on the top shelves for easy access to everything else. “Hidden” Appliances – Move over, stainless steel. We are finally seeing a transition from the ever-popular finish to exciting alternatives such as bold colors, vintage styles, and paneled doors. I’m really enjoying this trend because depending on how it’s executed, it can really result in a more streamlined look. Alternative Stone Countertops – Granite Countertops have been a growing trend since…wait for it…1987. It’s definitely about time we transition out of this phase. If you’re in the market for a kitchen remodel this year, Quartz is the #1 pick, with Marble not far behind. Backsplashes With Pizazz – A far cry from the uniform subway tile we have grown to know and love, 2018 is opening our minds to other possibilities. Look to install patterned, textured, and even cement tile this year. All Black Kitchen – You read that right. All black – metal, wood, stone, everything. Is it something most people will choose? Maybe not, but it sure would be sophisticated if executed properly. Terrazzo – Dating as far back as 9,000 BC, Terrazzo is traditionally a flooring material made by exposing and polishing marble chips on the surface of concrete. Nowadays, we also see it made with chips of quartz, glass, and granite. Because it can now be precast, Terrazzo can also be used for countertops and backsplashes. Brass – Think knobs, pulls, fixtures, and lighting. Chrome has become so mainstream that its alter ego is making a welcome entrance this year. Two-Toned Cabinets – Folks have been installing islands of a different color than their cabinetry for a while now, but this year we are seeing the trend pushed further. Achieve this look by selecting bottom cabinets in a different hue than your top cabinets. Greenery – When you consider the air inside your home is often two to five times more polluted than typical outdoor concentrations according to the EPA, you can breathe a sigh of relief with this trend. Bigger is better, aim for a minimum of two plants per room, and keep an eye out for dramatic plant walls in commercial kitchens. So there you have it; some of 2018’s predicted kitchen design trends. For more design insight and to get your design questions answered in real time, Join the Q&A Hangout over at Facebook.